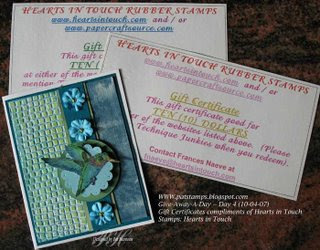 Day 4 of the TJNL Giveaway is compliments of Hearts in Touch. Today the lucky winner will receive $20.00 in gift certificates for merchandise on the HIT website. You'll also receive the card shown. Many thanks to Frances Naeve, owner of HIT for her generosity. In order to enter you must leave a comment on Pat's Blog Post by 11:59 EST on Friday, October 5th.